Can failed projects be fixed? There are many cases in which the water supplies installed in the past by other organisations are not up to standards. There may be issues with their construction or their maintenance. Many of these existing water supply sites could be improved, but community control and maintenance must be facilitated and encouraged. Here are a couple of examples. Birtara is one of the unions where we currently work (unions are the smallest administrative areas, each further divided into several wards). 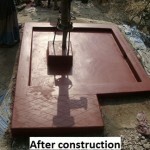 In 2011, the government installed a deep tube-well in the village of Anayatpur. However, a platform was never built, which made water use less accessible and increased the risk of bacterial infection. AMRF has worked with communities to form CBOs in every ward of the Birtara union. Representatives from this particular ward CBO applied to AMRF for the construction of platform. The CBO collected 500 taka as community contribution (total cost was 8,700 tk) and the work was completed late November 2013. Shologhar is another union situated beside the Dhaka-Mawa highway. There is a busy bus stand and a small market with many shops, restaurants and tea stalls. On the other hand, there is only one single arsenic free deep tube-well, which was installed by the government in 2007. The platform was damaged and it is not easily accessible due to its position relative to the level of the road. CBO representatives in this particular ward visited the site and decided to apply to AMRF for the construction of a platform and a stairway. Community contributions were collected and the construction was completed late November 2013. Through these additional steps, perhaps some of the failed projects that we have encountered could be rehabilitated.